SwissBits Review – SwissBits.info is a Scam! SwissBits is an online investment solution which promises investors quick returns. Their website is literally one page long and it does not provide any valuable information. They are operational for roughly 7 months as of November 2018. This firm advertise returns of up to 270% after 3 days. Regardless of what financial instruments an individual trades, it is impossible to sustain these kind of numbers. Moreover, the website does not reveal any details about the creators or the employees. When we investigated this platform, the number of disturbing factors kept on growing. To know why we have labelled them as a scam, read our full review. All the companies which offer investment products to the public that carries risk has to be regulated. Given the history of fake platforms, it is best to choose regulated firms only. 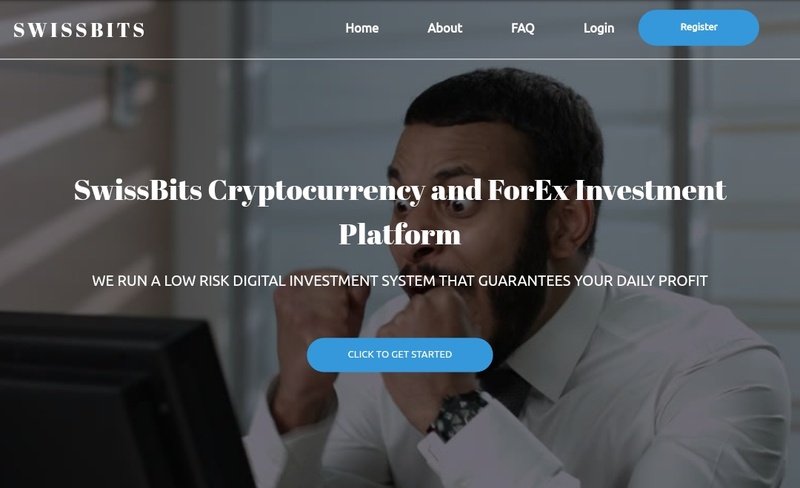 SwissBits represents an ICO which means they raise money to trade Forex, Cryptocurrency and Shares. The profits are given to the investors after the contract expires. We didn’t find any details about this company on the database of FCA and FTC. In short, they are an illegal enterprise. This firm does not reveal any information regarding the legal aspect. We searched their platform, but there isn’t any details which would help us trace their identity. If you encounter any problem on this platform, then it will be daunting for you because they do not have a support team. Ask yourself, what kind of investment firm operate in such a blatant way? There is no proper explanation to this question. At first, they claim to be involved in Bitcoin trading. In their About Us section they state that, they are involved in Forex and Stock trading. Regardless of the markets, they still have not put up any narration. We do not know what type of trading methodology they use. What factors influence their trading bias. Moreover, they do not showcase any trading history. Cryptocurrencies are now the most volatile markets ever. However, that does not make them a magical solution to procure wealth. If you handle the markets without equipping yourself with proper education, chances are you will lose your entire investment amount. So do not entertain these kind of firms, which promises to make you rich quickly. Profits are both exciting and enticing. Trading provides immense number of opportunities, but it certainly does not mean it is easy. Take a look at the plans they advertise. The registrant information is untraceable. We came to know the following important details regarding them with the help of whois.com. There is no information about them on alexa.com. As a result, we do not know their traffic statistics. First of all, this firm is operating in an unethical manner. It is against the law to portray any kind of returns which might get generated from trading. Not to mention, their fund managers are all imaginary characters. On what basis, can you possible trust these strangers? This platform does not offer demo account. Therefore, you cannot test their efficiency without putting your funds at risk. They have the audacity to ask for your money, without providing any credible proof. Obviously, you should be reluctant to even entertain them in any way. The way this scheme is structured is similar to a ponzi type fraud. In reality, they are just using new participant’s money to payout the old clients. As you can already tell, they won’t be operational for long. SwissBits is another fraudulent firm which is looting the investors. They will be out of business in the near future. Say no to every offer which is not backed up by proof. Of Course, in markets nothing can be guaranteed. However, you should at least have a system which provides you an edge. Always give utmost importance to risk management, the rest will fall into place. Do you have any experience with SwissBits.info? Share your opinion by commenting below.